You know what else this money could have been used to do - It could have simply been given to 9,000 Americans in million dollar chunks, in effect creating 9,000 millionaires. Worse, the story notes that the $9 billion also created 4,600 indirect jobs, which when added to the direct number is still thousands less than if the Government simply gave the money away as part of a lottery. My 2009 post 'Better way to Spend $825 Billion in the Name of Stimulus' notes that instead of using the stimulus money for projects, that it just might be better to simply use it for a lottery where there were 800,000 first prizes of a million dollars each.Would this have been fair? I think it would have been more fair than giving huge amounts of money to politically connected companies like Solyndra who just turned around and burned the cash. My oldest is finishing up her last day of First Grade this week. This is also the time that I am completing papers for my youngest to start kindergarten in the fall. One form that we had to complete for each of them contained questions on whether they could speak a foreign language and whether there were any foreign language speakers in the house. The form noted that if you answered 'yes' to these questions that your child would automatically be labeled a non-native English speaker (or something similar to this. I forget the exact designation). I was hesitant to mention any foreign language skill for my daughter, simply because she was also a fluent native English speaker. After all, she was born here and basically her entire foreign language proficiency was the result of my wife being an army of one in teaching our daughter her native language. I was afraid that she would end up in some special treatment intended for actual foreign language speakers with limited English proficiency. However, since we did not want to lie on the form, we told the truth. So our daughter was tested in Kindergarten on a 1 to 6 scale in her English proficiency and received a score of 4. The test results came with a two page explanation of the results. However the explanation was totally useless in determining how our daughter did in the exam because nowhere in the paper did it explain that 4 was the highest score a Kindergarten student can receive because at that level they do not test reading comprehension. Leave it to the Government to design a test where a child can get the highest grade while leaving the parents completely confused as to how their child could do so poorly on the test. So there you have it. 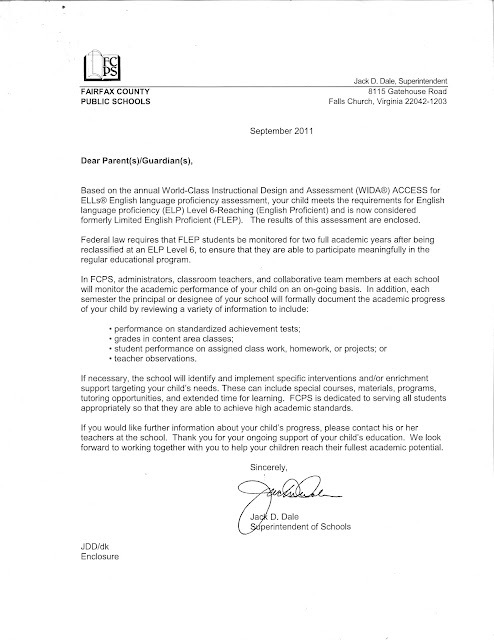 The Government had classified my child as LIMITED ENGLISH PROFICIENT solely based on our declaration that she had the ability to speak another language and was in a household where at least one parent also spoke a foreign language. There was no testing done to ever determine if there was any limitation to her English proficiency. She had spent two years in pre-school. Never was there any comment concerning any problems with her language skills. This is all due to idiotic Government Regulations. Worse, I have no doubt that my daughter is now a stat supporting how great the school is in successfully turning children with limited English proficiency into proficient students. A stat that will now reduce how badly the number that fail to achieve that goal. Don't get me wrong, our local elementary school is great. However, they did nothing to improve her proficiency in relation to other native English-speaking classmates as she was a native speaker to begin with. Well, I have learned my lesson. During the completion of the enrollment forms for my son, I have included a letter refusing to permit my son's participation in this program. Apparently the form produced a bit of consternation at the school, but it also resulted in discovery of a form that excludes my son's participation in this program. While my daughter is all good with participating in any sort of project or test, My son is a little more stubborn and the last thing I need is for him to notice that he is being testing when others are not. Because he will not take their exam or create some problem where there is none. I do believe in testing, but I am against senseless testing. And this program is needlessly creating students in need that don't exist.